It’s the next best thing to having your own personal running coach. Forerunner 620 features recovery advisor, race predictor and VO2 max estimate so you can train smarter. When used with the HRM-Run monitor¹, the 620 also gives you feedback on your running form by showing your cadence, ground contact time and vertical oscillation. For indoor training, the built-in accelerometer tracks distance, so you don’t need a separate foot pod. With Forerunner 620, you don’t have to guess how much recovery time you need between workouts. It knows your physiology based on your heart rate data, so it factors this against your last workout and then shows how much time before you are fully recovered and ready for your next hard running workout. When wearing HRM-Run, the 620 provides a recovery check, which is a real-time indication of your state of recovery within the first several minutes of your run. When you’ve completed a run, the recovery time shows how long before you should attempt another hard workout. Color coding on the gauge makes it easy to interpret — green means you’re good to go. When you see red and a recovery time of more than 3 days, you might consider taking a rest day or just doing a light recovery run. 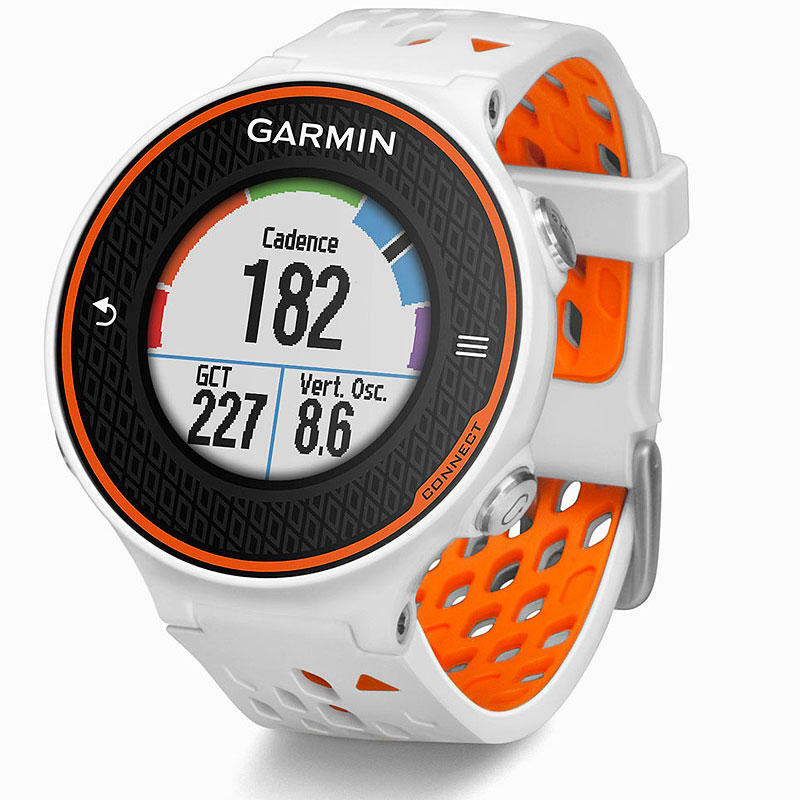 The 620 is the first GPS running watch that provides feedback on your running form by reporting multiple metrics. When used with the HRM-Run monitor¹, the 620 reports your cadence, vertical oscillation and ground contact time. These metrics are called running dynamics, and they effect your running economy. The HRM-Run has an accelerometer, which measures your torso movement as you run to compute these metrics. Cadence is the total number of steps you take per minute, left and right foot combined. Vertical oscillation is the degree of “bounce” in your running motion, measured in centimeters. Ground contact time is just like it sounds — the amount of time your foot spends on the ground during each running step, measured in milliseconds. A color gauge makes it easy to see how your running dynamics compare to other runners. Forerunner 620 can send your data wirelessly to Garmin Connect. It can transfer the data through the Garmin Connect Mobile app on your smartphone². You can also set up one or more Wi-Fi hot spots, and the 620 will automatically sync with Garmin Connect when in range. It also features live tracking, which allows your friends and fans to follow along and see your stats in real time. 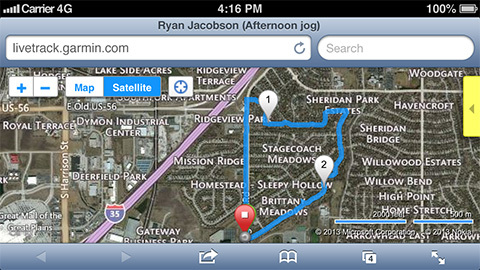 Pair your phone with the 620 throughout your run to use LiveTrack. You can also share your victories by posting updates through social media with the Garmin Connect Mobile app. 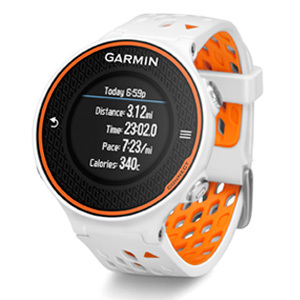 And, for real-time coaching as you run, the 620 is compatible with free training plans at Garmin Connect. By regularly connecting your watch to Garmin Connect, you'll also benefit from a faster GPS fix due to satellite data that will be sent to your device automatically.